Can Anyone Identify These Cars? Filed to: What car is this?Filed to: What car is this? As you may know, there were some deadly tornadoes in Texas over the weekend. 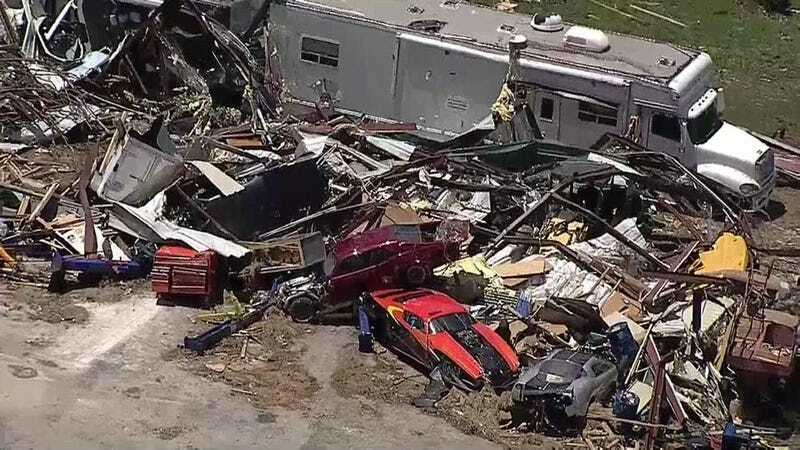 11 people died and a car dealership was wiped out. I-20 Chrysler Dodge Jeep Ram of Canton took a direct hit from a mile wide EF3 tornado. In the carnage, I came across these pictures. They aren’t from the car dealership, but are from the same area. The header pic looks like someone’s home garage/shop got ripped to shreds. I’m just curious as to what those cars are. Maybe someone here knows these cars personally? The burgundy one kinda looks like a Nova. The red one is maybe a 1970ish Camaro modified for drag racing? The grey one with black strips, I’m getting a Lotus vibe off from the rear, but not as much from the side. Here’s another picture of them. From the same neck of the woods, what is this car, the red one, that was damaged in one of the tornadoes?